As part of my birth story, I chose to take photos of the experience so I could remember how Elliott came into this world. I was very prepared for a natural birth and so was Brad. We read many books and took 12 weeks of Bradley Method classes to prepare us for this challenge. I didn’t share this intention with just anyone though, because I find some people to be less than encouraging when you tell them that you intend to give birth naturally. I dealt with very little of discouraging comments by being careful who I chose to tell. So I’m sharing it with you now so you can fully understand Elliott’s birth story. Being my first birth, I naturally thought that Elliott would come after his due date. 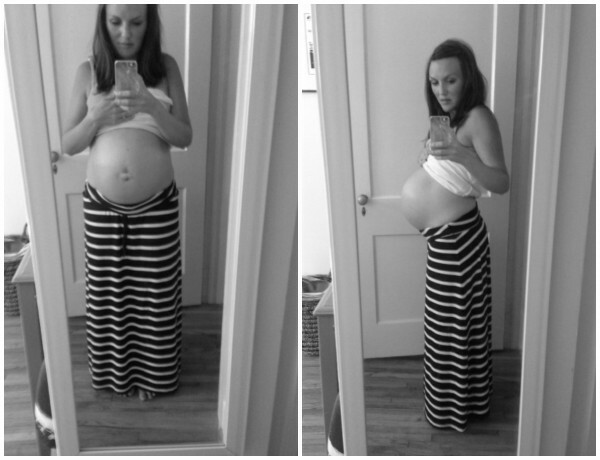 Most first timers go about a week after their due date, even though it seems most of my friends have gone before their due date. On Friday, August 23 (Elliott’s first due date before they moved it up due to his size during an ultrasound), I thought I felt contractions around 8 am when I woke up. However, not knowing what actual contractions feel like, I tried not to get too excited and moved along with my day. I threw on some clothes and a hat and went to grab breakfast for Brad and I at a new bakery in Uptown. I snapped these photos the morning I went into labor. Funny how I didn’t snap any other bare belly photos except this one incidence. I was home by 9:30 am and by 10 am, I was ready to tell Brad that I was having labor pains. It seemed as though they were increasing in intensity and were close enough together that some sort of pattern could be established. I started timing them on “Full Term”, an app I had downloaded to time my contractions several weeks prior. I called my doula, Rachel, and she said that the best thing for me to do would be to take a brisk walk. Brad finished up a phone call for work and we headed out on our walk. However, at this point the contractions had started coming on stronger, so every 3-5 minutes, I had to stop and lean on him until the contraction was through. We walked about a mile and I decided that I was finished with walking for the day. I settled down on the couch and labored for a couple of hours, until my contractions were stronger and closer together. At this point, I thought I would feel more comfortable in the bed. Brad stayed with me the entire time and we continued to track my contractions and clue Rachel in on what was going on. We also told my parents and Brad’s parents. Brad’s parents had a 6+ hour drive and they planned to leave as soon as we knew it was the real thing. At some point, Brad decided that Rachel should come to our house. 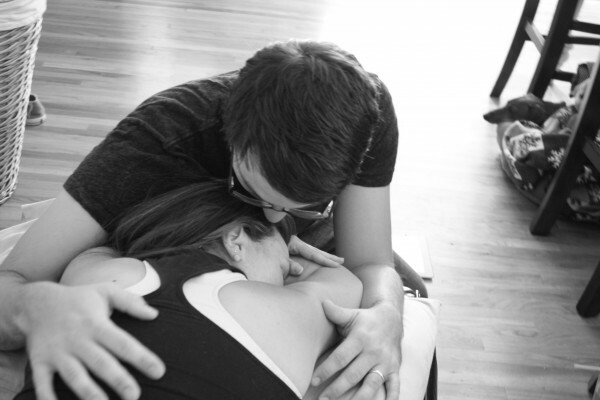 My contractions had continued to grow in strength and we wanted someone there to coach us through the more difficult part of the process. When Rachel arrived a few minutes later, she encouraged us to try the different positions we had practiced, which meant I had to get out of the bed. She encouraged me to walk, so I walked around our kitchen island, bending over the island for support with each contraction. At some point, my legs started to shake and I felt unsteady. I returned to the bed several times to get more strength before I walked again. We also tried laboring in the bathtub for a while, which was the most comfortable part of the laboring experience. Around 6 pm, we three decided that it was time for me to go to the hospital. I had labored at home for eight hours and a part of me was afraid of waiting too long and ending up with a home birth, which we were not prepared for at all. Getting out of the tub and readying myself to appear somewhat decent for checking into the hospital was challenging to say the least. It’s too bad I couldn’t press pause on my contractions to put clothes on and find my shoes. Every few minutes, I would drop to the floor on all fours and get through another contraction just as we practiced in my Bradley Method Class. Laboring in the car was also no joke. Sitting in the car is not a good position for laboring, so I tried not to focus on the pain and instead focused on the fact that going to the hospital was one step closer in getting my baby here. Once at the hospital, we checked in and were taken to a natural birthing room. These rooms have tubs for laboring and aren’t set up for epidurals. I immediately got in the bed and was strapped to a fetal heart rate monitor. These are used during the entire time of a traditional delivery, but not used often in natural childbirths so you can move freely without being strapped to a machine. My hospital required that I be hooked up for 20 minutes, and then it could be used for intermittent checking. I was also checked to see how far dilated I was — 8 cm and 100% effaced! This made me really happy because it meant I had made a lot of progress on my own with the help of my husband and doula. You have to get to 10 cm before you can start pushing so I was encouraged that I was so close. However, according to my midwife I was in “transition” which is the most painful part of childbirth for most people and boy could I feel it. My labor had been difficult before, but now it was pretty excruciating. I decided to labor in the tub for a while, which I found to be less comfortable than the tub at my home. I actually found the jets to be bothersome and aggravating and asked for them to be turned off. At some point, I got out of the tub so my midwife could check me again for dilation and so the nurse could monitor the baby with the fetal heart rate monitor. After six hours of laboring at the hospital, my cervix had dilated to 9 1/2 centimeters. My cervix just wouldn’t open completely. My midwife told me that if it felt good to push, then I should push, so I started to push with the next contraction. She said pushing might actually push the rest of the cervix away. After a few contractions of pushing, my water finally broke. Pushing without any drugs was this strange mixture of extreme pain and relief. I pushed for two hours. I pushed on my back with my legs bent in a semi-squat position. I pushed on both sides. I pushed on my knees lying across the back of the bed on my stomach. I even pushed on the toilet, which my doula said should help because I was working with gravity. I hated laboring on the toilet, so I only labored here because it typically makes a real difference in getting the baby to move. It was one of the most painful positions for me. After laboring on the toilet, until I could take no more, I returned to the bed where I was checked again. I was still at 9 1/2 cm and no my cervix was swollen from all the pushing. On top of all of that, the fetal heart rate monitor showed that every time I pushed, Elliott’s heart rate would drop from the 120s to somewhere between the 70-90s. The midwife said I had to stop pushing. She said that an epidural would be the best way to relax my cervix and make the progress I needed to birth my baby. At this point, I had been laboring without drugs for 14 1/2 hours, including pushing for 2 hours. I was dead tired. My legs shook uncontrollably, even when I wasn’t experiencing a contraction. My midwife also mentioned that a C-section was potentially needed since the baby would go no further into the birth canal. I have goosebumps!!! You are so brave and so strong! I can’t wait to read part II! aah! You left us hanging! So excited to read what happens next! Wow! Your photos are so powerful. You are incredibly strong and brave! I love, love, love birth stories! My natural birth plan was 5 pages long and I gave it to every health care practitioner that happened through my hospital room. It included hours of positions, ways to reduce pain without drugs, different relaxation and visualization techniques… you name it. Well, Baby N came in less than 5 hours with 30 minutes of pushing. The best laid plans are usually just words on paper. I can’t wait to read Part II!! Really?!? My heart is pounding out of my chest with excitement! Beautiful story and beautiful pictures! I can’t wait!!!!! WOW! Can’t wait to read Part II. I cannot imagine 14.5 hours… you are amazing! p.s. my body hurts just reading this… I did NOT enjoy labor.